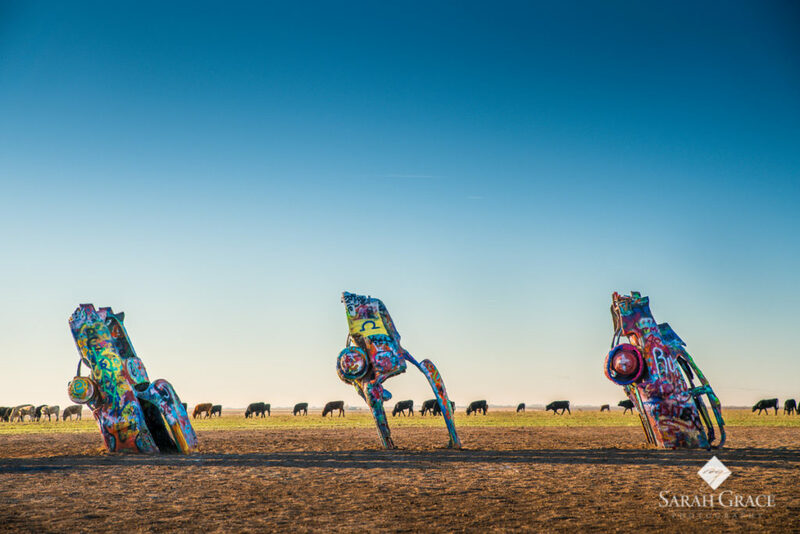 Last month we left off with the departure of Cadillac Ranch in Amarillo, Texas. 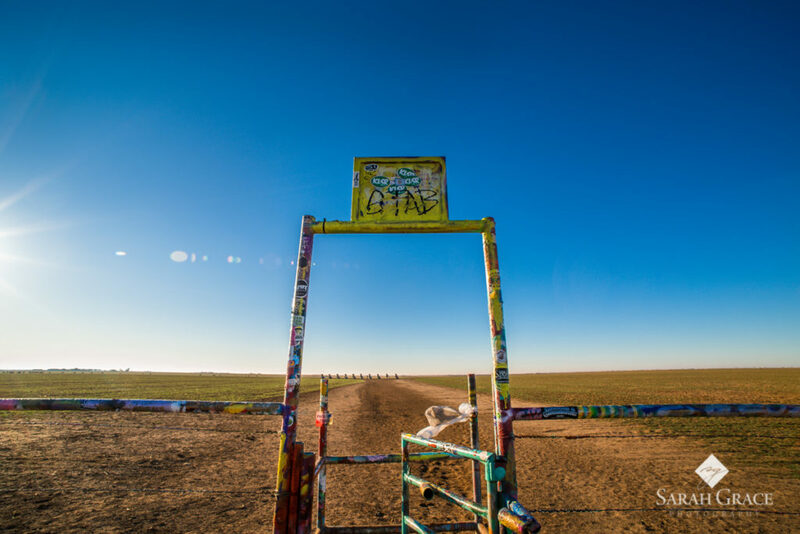 What I remember most about this morning photo shoot of Cadillac Ranch is the chill, 27 degrees, and a howling wind blowing at 15-20 mph. This combination caused my eyeballs to excrete water-like substances. 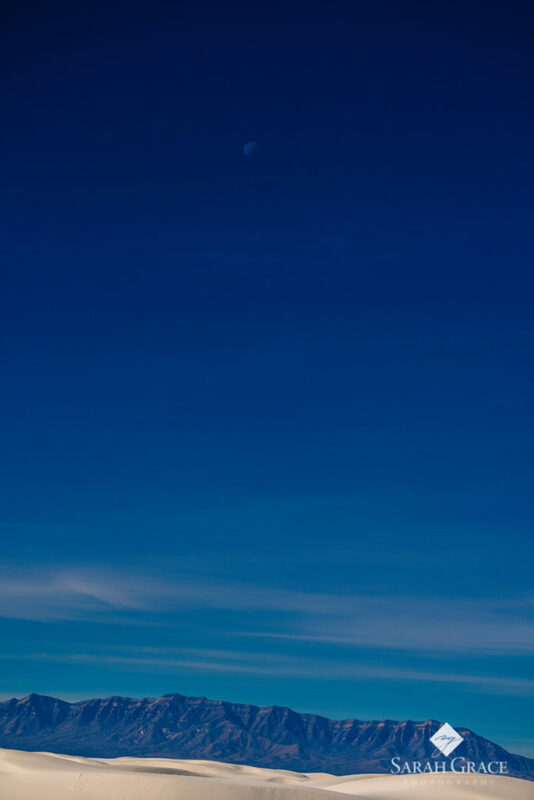 Oh ya, and the moon was visible in the bright blue sky. This made for some pretty cool captures! I met a father-son team traveling from Washington DC to Los Angeles, California for the son’s third and final interview with a company where it would be his first job. The young man was eager, chatty, and full of positive energy. It was a beautiful reminder of how we feel when we begin new adventures. It was also a reminder to be kind to everyone we intersect with as they may either be having the happiest day of their lives or the toughest. 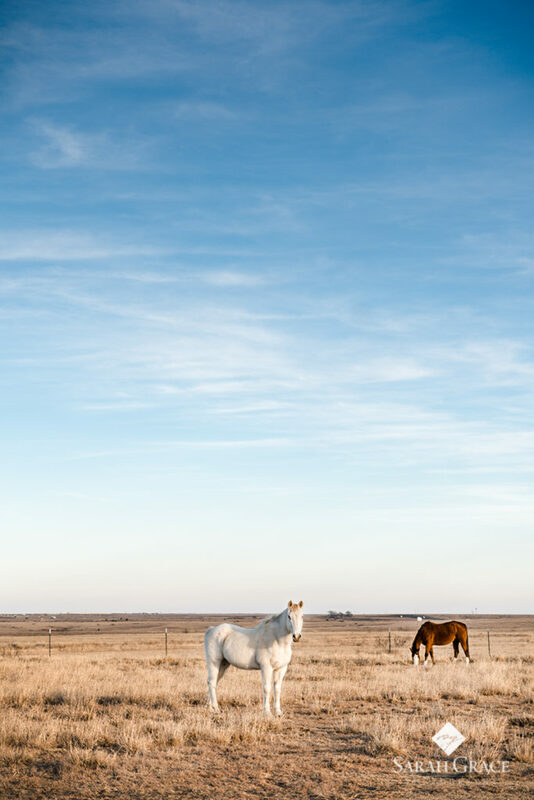 It was Saturday morning, and as I pulled away from Amarillo, I was happy to be back on the road, unsure of what was awaiting me in Alamogordo, New Mexico (the closest location to the place in my dreams). The news I watched, while eating my Texas shaped waffle, told me that the government shut down was over. 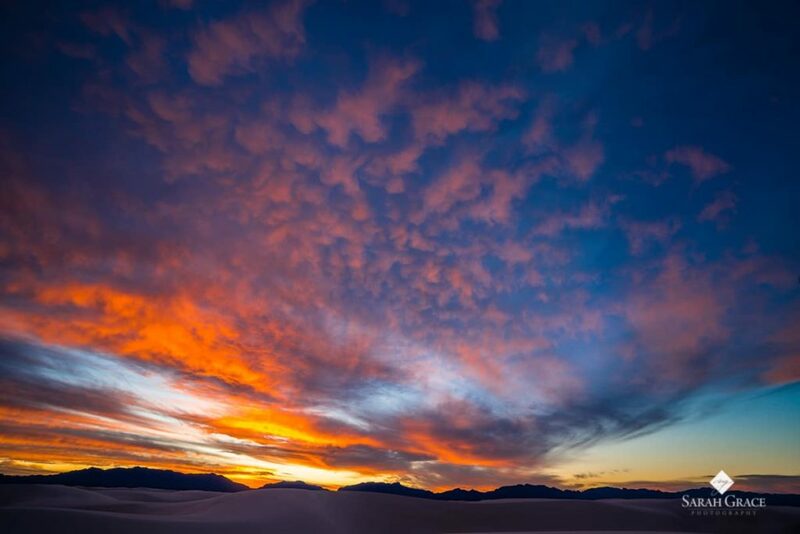 While this was wonderful news, it was also concerning as the White Sands National Monument website and voicemail still indicated that the park was closed. 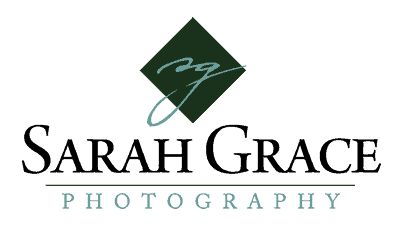 The landscape easily distracted me, as in northwestern Texas, the scene out my windshield quickly morphed from flat, arid plains to carved out mountains in nearly an instant. The elevation climbed and the air became even gustier. Slowly, I started to see small and then much larger patches of the “S” word on the ground. It seemed my luck had followed me straight down 35W and west onto I-40. Before too long, my stomach spoke to me in a very incessant tone. To make everyone happy, I stopped at a Mexican restaurant in Santa Rosa and had myself a shrimp gordita for exactly $3. It was the best, and probably only, gordita my mouth has ever experienced. 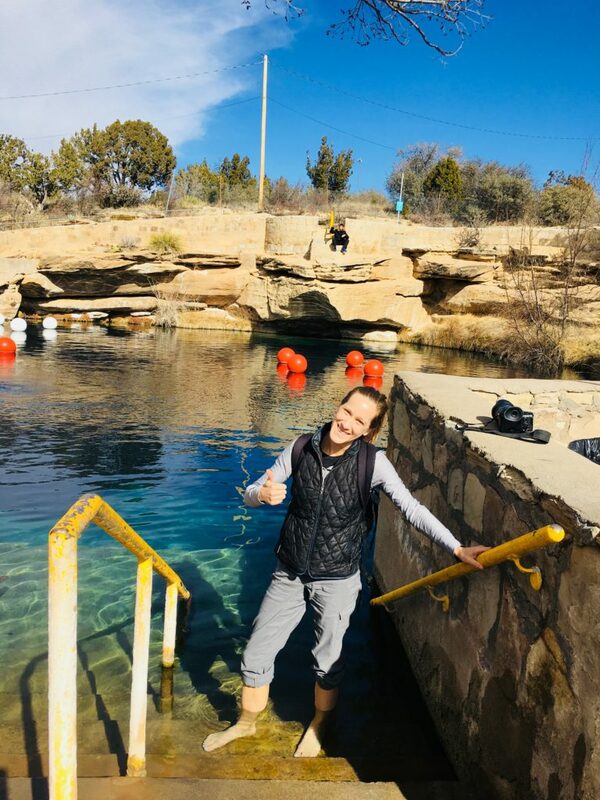 While in Santa Rosa, my intention was to experience the Blue Hole Recreation Area. The Blue Hole hosts one of the deepest sinkholes at 82 feet and it’s mineral water remains a constant 62 degrees. The water in this sinkhole refreshes every 6 hours due to an underground system of 7 lakes! The clarity of this aqua colored water is spectacular and I can see why there are so many scuba divers training here. I know most of you are wondering if I donned a wet suit and got in with them. Truth be told, I was invited, but decided that a full feet dip in the Blue Hole waters and a picture to prove it would be a perfect memory for me. Highway 54 just north of Alamogordo, was one of the most frightening stretches of solo travel I experienced on this trip (outside my experience at the Mississippi rest stop). The sun had started to set, I had just under a 1/2 of tank of gas and had just gotten off the phone with a friend who had been staying in New Mexico. The scene outside my windows was consumed with miles of desolate desert scapes and zero signs of life – not only were there no signs of anything living on the sides of this country road, but I didn’t pass or see another car for at least 19 miles. If there was ever a place to disappear, without a literal trace, this certainly felt like the proper place. I ran downstairs, scarfed down as much protein & carbs as possible, skipped some coffee and threw my few bags of belongings into the Jeep and away I went! I arrived at the park right at opening time, 8 am and yes, those iron gates were indeed open! After 2 miles in, I stopped at the very first trail, Playa Trail and began the first of my five hikes that day, totaling around 10 miles of foot climbing. I hiked every square inch of the designated trails and several more on my own. Reading about the animals occupying the park and how their characteristics have transformed over the years to camouflage with the landscape is pretty fascinating. At the beginning of my second hike, I was overcome with feelings of gratitude and peacefulness. This place, at this moment, at this very time, was exactly where I was intended. 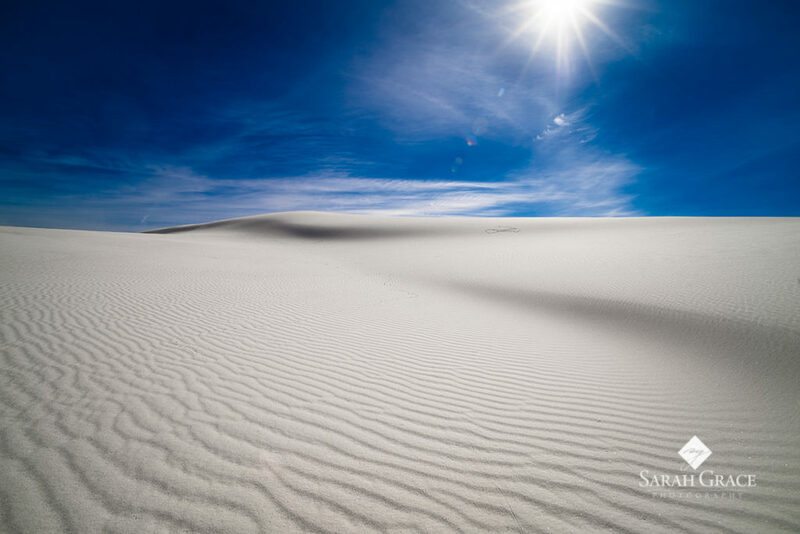 It felt as if each of my life moments had lead up to this (it was Sunday morning, after all, maybe it was the divine being speaking to me) and I had a very spiritual experience during my 10 hours in the White Sands National Monument. Perhaps it was being surrounded by a literal sea of white gypsum dunes, maybe it was the bright sun shining high and warm in the royal blue sky, or possibly the experience of scrambling up fine gypsum sand dunes reaching 20 feet high – maybe it was finally the feel of heat (52 degrees) and a need for polarized sunglasses that brought me to tears of joy. Either way, it was me, a camera and nature, no place I’d rather be. While passing thru a basin, I looked up to see a haze come across the sky which created a rainbow in a perfect circle, encompassing the sun. A sight I have never seen before and one I am not likely to forget. 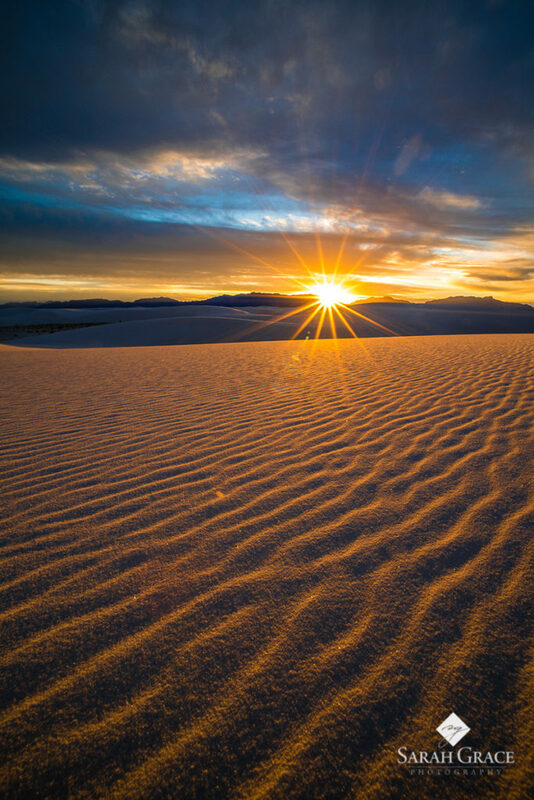 With the Tularosa Basin covering a total of 275 square miles, this makes this area the largest gypsum dune field in THE WORLD. White Sands preserves more than half of this oasis and is quite frankly one of the worlds greatest experiences, in my book. 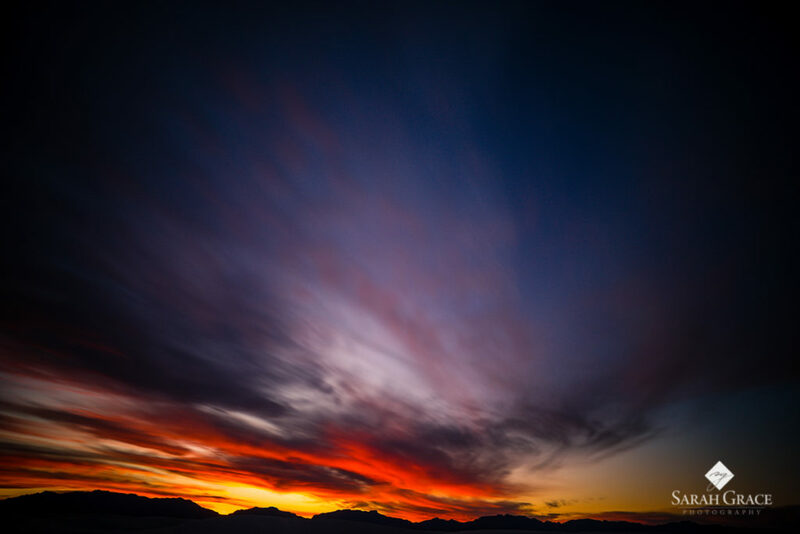 These Alkali Flats are nestled between the San Andreas Mountains to the west and the Sacramento Mountains to the east, which made sunset in the basin, quite a dramatic scene. With the hazy skies and a fifth and final 5 mile hike to scope out the best spots for sunset, I found my cove between the 4th and 5th mile markers on the ridge with a clear view of the San Andreas and Sacramento ranges. Sunset a few minutes before 6 pm, which is when the park closes and lit the sky up with raspberry, lemon, and lavender. With the Sacramento Mountain range glowing red and pink, I was spinning in circles to capture all the beauty that surrounded me. My soul was filled full, my emotions were focused on gratitude and bliss. 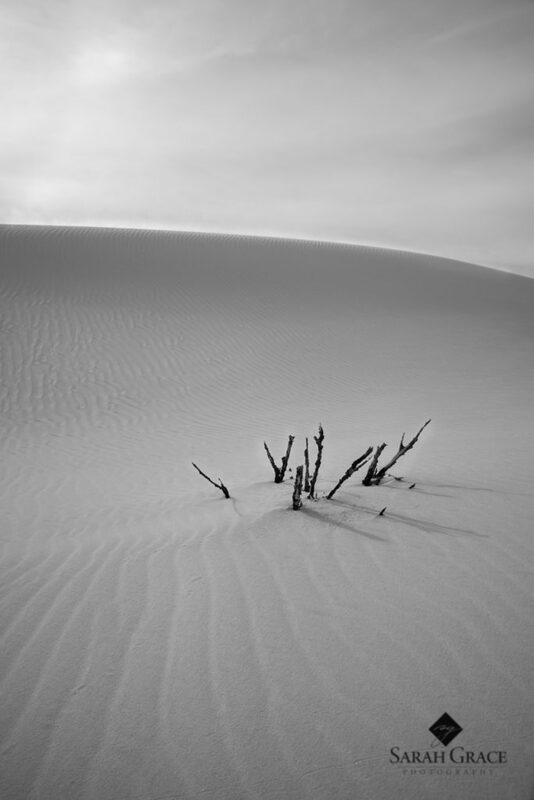 The dunes are very serene, the only sound is a rare bird or happy human. What an honor to be able to hike these dunes and feel like I am on a continent across the globe. I was literally the second to last person speeding out of the monument at 10 after 6 pm. Reeling about my experience, I was driving the Jeep which looked straight out of a Jeep commercial and the denseness of the night encroaching. 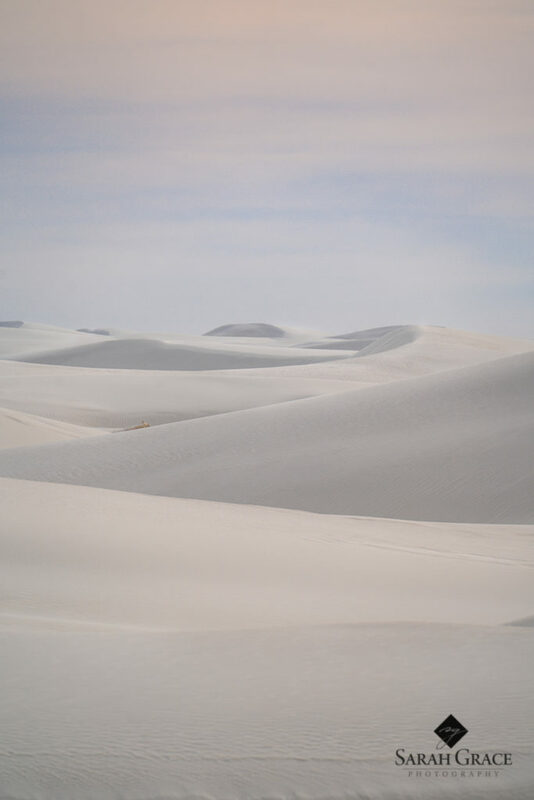 White Sands has hundreds of miles of sand which can blow, shift, and bury roads, mile markers, and vegetation in a matter of hours. When I travel solo, there are many items I carry to prepare myself. I had a gallon of water, polarized sunglasses, a hat, two pairs of gloves, hiking shoes, hiking pants, several layers of clothing (moisture wicking to heat retaining/wind breaking), a military grade whistle and a kuboton, (handheld self-defense weapon), I also have a fully charged cell phone with GPS tracking. While this wasn’t the end of the line for me, I did make my way out of town that night and into my very first mandatory roadside check….